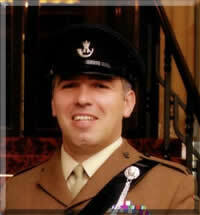 Colour Serjeant Jaime Moncho, of 2nd Battalion The Rifles was not only Platoon Serjeant to Rifleman William Aldridge during his operational tour of duty in Afghanistan, but became one of the most senior men left to take control, whilst under enemy fire, in leading the evacuation of his wounded comrades on the fateful day (July 10th 2009) that witnessed five members of the patrol group, including their Platoon Commander suffer serious life-threatening injuries and five further young soldiers lose their lives. His inspirational leadership and selfless heroics were recognised and earned him the Conspicuous Gallantry Cross. "I am absolutely overjoyed at being asked to become a Patron of the Foundation. It is both humbling and an incredible privilege for me. As a serving soldier, I believe it is also quite a unique opportunity within the Armed Forces. I have the greatest respect for all involved and I envisage it being a resounding success". 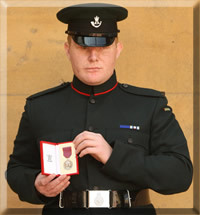 Paul Jacobs: Rifleman Paul Jacobs was awarded the George Medal, conferred to him by Queen Elizabeth II at an investiture ceremony held at Buckingham Palace on June 2nd 2010. He displayed sheer personal courage and startling determination trying to help a fallen colleague during his operational tour of Afghanistan in 2009. Rifleman Jacobs, of 2nd Battalion The Rifles, was blinded and suffered multiple injuries when a second colleague stood on another improvised explosive device as they patrolled in one of the most heavily booby-trapped roads of the Upper Sangin Valley. Despite being seriously wounded, he had the presence of mind to drag himself back onto a route safe from IEDs that he had cleared, to make his own rescue much safer for his colleagues. Paul, affectionately known by his friends and comrades as ‘Big Ginge’, has not let losing his eyesight deter him from confronting new challenges or participating in fundraising events for Forces Charities. He completed a gruelling hike to the summit of Kilimanjaro in aid of St. Dunstan’s Charity – However, not content to rest on his laurels, is planning a parachute jump and will be participating in the Great North Run. 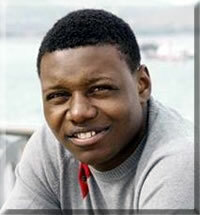 His greatest ambition is to be the first blind person to swim the English Channel. 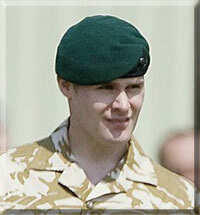 Rifleman Paul Jacobs said, “I feel privileged to be a Patron of the William Aldridge Foundation. 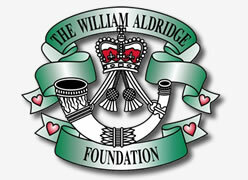 Rifleman William Aldridge was a personal friend and colleague, I will do all I can to help his mother assist others through this fantastic Foundation and honour his memory”. Mark Ormrod: Best known as the author of the truly awe-inspiring book Man Down written to document the details of his moving & courageous journey to recovery after he was blown up by a Taliban landmine in Afghanistan. Brave Mark lost both his legs and an arm in the incident, but showed true grit, when against all the odds, he marched out in public to rejoin his colleagues at 40 Commando to receive his Campaign Medal! He has since returned to work with the Marines, campaigning tirelessly for countless Forces Charities committed to helping other injured Servicemen and women wounded in battle. "As far as Im concerned, we can never do enough to help our Forces. It's all about trying to give something back and this is a fantastic opportunity for me. I hope the Foundation will achieve every one of its goals. I'll certainly do my bit to help". Ben McBean: Was famously dubbed a Hero by Prince Harry when they shared a flight home from Afghanistan, after Royal Marine Ben was grievously wounded by a Taliban I.E.D. Despite losing an arm and a leg, he quite remarkably participated in the arduous London Marathon and successfully climbed to base camp on Everest! - raising charitable funds to support injured Service Personnel. The duo of achievements won him the hearts of a nation and a Millie Award for overcoming adversity. "I am thrilled to be asked to be a Patron of the Foundation. I would urge everyone to show just how much we really care about the sacrifices made on a daily basis by our British Armed Forces and support the charities doing such magnificent work for our Troops and their families".